After decades of warfare, the tribes of the Tiste Edur have at last united under the rule of the Warlock King. But peace has been exacted at a terrible price - a pact made with a hidden power whose motives are at best suspect, at worst deadly. To the south, the expansionist kingdom of Lether has devoured all of its less-civilised neighbours with rapacious hunger. All save one - the Tiste Edur. But Lether is approaching a long-prophesied renaissance - from kingdom and lost colony to Empire reborn - and has fixed its gaze on the rich lands of the Tiste Edur. It seems inevitable that the tribes will surrender, either to the suffocating weight of gold, or to slaughter at the edge of a sword. Or so Destiny has decreed. A pivotal treaty between the two sides nears - but unknown ancient forces are awakening. For the impending struggle between these two peoples is but a pale reflection of an altogether more profound, primal battle - a confrontation with the still-raw wound of betrayal and the craving for vengeance at its heart. Midnight Tides marks the third point of the epic triangle that is the Malazan Book of the Fallen. While the first books in the series introduced and then expanded upon events occurring on the two Malazan-occupied continents of Seven Cities and Genabackis, Midnight Tides instead presents us with a brand new continent and an (almost) entirely new cast of characters – a bold risk, yet one that yields substantial reward in the form of a complex yet tightly-woven tale of dark intrigue and tragedy. Although Midnight Tides is the fifth book of The Malazan Book of the Fallen, its story actually takes place chronologically before the events of the first four books, and as such could potentially be a great starting point for newcomers to the series. Erikson kicks off Midnight Tides in stunning fashion with yet another amazingly cinematic prologue. Outlining the huge-scale historical conflict between three ancient races, he immediately sets the scene by painting a vivid and horrifying picture: of betrayal on an appalling scale, and of the destruction of an entire race, simultaneously foreshadowing future events and introducing with a bang several of the novel’s major themes. A new continent, complete with two major civilisations and a plethora of oppressed subcultures, opens up new opportunities for Erikson to explore themes of expansion and greed, stagnation and tradition, power and empire; all of which have to some extent been underlying themes throughout the series, but are perfectly epitomised here in the conflict between the tribal Tiste Edur and the wealth-centred people of Letheras. Admittedly there are instances where the author painfully belabours the point by occasionally falling into rambling sermons about the evils of capitalism; nonetheless, Midnight Tides does an excellent job of introducing a hefty new chunk of the Malazan saga. Thus begins the story of a nation’s fateful journey into conflict and madness, poignantly symbolised through the hateful yet tragic character of its Emperor. Despite being filled with a cast of completely new characters and unfamiliar locations, Midnight Tides is actually remarkably easy to follow. Unlike the previous books in the series, which zip about between numerous parallel storylines and often leave casual readers scratching their heads, here the main story boils down to the rising conflict between two factions: the Tiste Edur and the Letherii. Almost all characters fall into one camp or the other, and for the majority of the story Erikson uses their alternating POVs to tell the tale of how these two powerful nations descend into war with one another. Although limited in comparison with other books in the series, the variety of characters gives us radically different perspectives on each of the two warring cultures. The ‘barbaric’ Edur are alternatively shown from the point of view of a nihilistic slave, a morally-conflicted high-born warrior, and a tired Letherii ranger; while the ‘civilised’ Letherii are shown to us through the eyes of a proud kingsguard, an eccentric citizen and a cynical manservant. Each character is interesting in his or her own way, and all of them are used to weave a tapestry of smaller scenes, each as fascinating and as poignant as the main story itself. Indeed, many of the main events would have occurred quite differently were it not for each of these smaller tales: three estranged brothers, a warrior doomed to die a thousand deaths, an entire race deceived into fighting a war on behalf of a malignant entity, a slave’s battle against possession, a merchant’s descent into despair, an abused slave with supernatural powers, and a badly-used noblewoman driven to madness. Thankfully, Midnight Tides is saved from becoming too bleak by regular infusions of Erikson humour, largely provided by the citizens of Lether. An undead nymphomaniac thief, an absent-minded sorcerer, and a half-giant with an enormous . . . set of lungs are just some of the highlights; and that’s without mentioning the most entertaining aspect of the book, which is without doubt the eccentric pairing of Tehol Beddict and his trusty manservant Bugg. Exceeding even the laugh-out-loud value of previous ‘comedic’ figures like Kruppe and Iskaral Pust, Tehol and Bugg are by far my favourite characters of the series to date, surpassing other spectacular Erikson pairings such as Mappo and Icarium, Gesler and Stormy . . . even Quick Ben and Kalam. The droll humour suffusing Tehol and Bugg’s every interaction is a perfect counterpoint to the dark tragedy unfolding around them, and provides a welcome contrast to characters such as Seren, Trull and Udinaas, who are all rather more serious and isolated within their own unhappiness. Add to this a series of minor characters who, despite being given minimal page time, are just as interesting as some of the major players – Silchas Ruin and Iron Bars, FTW – and you have one of the reasons Midnight Tides is regarded by many as one of the strongest entries in the Malazan series. 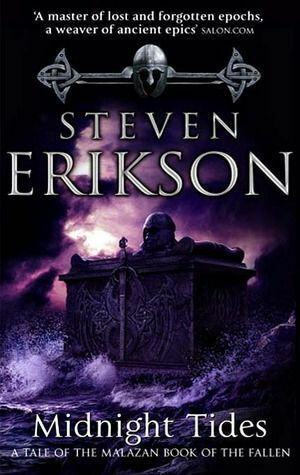 Perhaps another reason for this is the sense of place Erikson creates, particularly as much of the novel is set in only two main locations: the Tiste Edur village and the city of Lether. Although the story shifts back and forth between the two, the reader is transported instantly from one world to the next as a result of the fantastically vivid settings. Upon arriving at the Edur village we immediately smell the woodsmoke, hear the waves crash on the beach, feel the incessant rain on our skin and see the ever-present shadow of the Blackwood forest looming over everything. The city of Lether is similarly vivid and well-drawn, in sharp contrast to the Edur village: here, we hear the roaring cheers of the crowd at the Drownings, smell the rubbish-filled canal and rotting alleyways, feel the stifling heat of summer, and see corruption and oppression personified in the displaced victims of the city’s materialistic expansion. And throughout the whole of Midnight Tides is the sense that both societies are a throwback to a much earlier time. In contrast with the Malazan Empire and the cultures shown in earlier novels, neither the Edur nor the Letherii are familiar with the sophisticated magic utilised there: the Letherii mages draw their power from Holds, the primal ancestors of the Warrens used by the Malazans; and instead of the Tarot-esque Deck of Dragons, the Letherii use the Tiles of the Cedance. It’s obvious that this entire continent has lived in isolation from the rest of the world; that, despite their notions of civilisation, both the Edur and the Letherii still have a long way to go . . . and that perhaps each nations’ conviction regarding the superiority of their own empires may soon be tested by conflict with another, more advanced, empire. This is my second re-read of Midnight Tides, and remembering it as my favourite instalment of the entire series meant that I was kind of worried about revisiting it, particularly after my slightly disappointing experience of Memories of Ice. Thankfully, Midnight Tides managed to meet and even exceed most of my rose-tinted expectations. I’ll admit that the story took a little longer to get going than I remembered, but the rest of the book more than made up for that, particularly the last 200 pages or so. Erikson’s talent at creating jaw-dropping convergences is such that I can’t find the words to praise it highly enough. This book is perhaps the finest example yet of the author’s ability to seamlessly entwine numerous plot threads towards the end of the story: Erikson writes using ever-shortening segments and rapidly-changing POVs to simultaneously quicken the pace and draw out the finale, creating a spectacularly extended denouement of adrenaline-filled action and almost unbearable tension. Is it still my favourite book of the series? I’d say it’s currently vying with Deadhouse Gates for the top spot . . . but of course there are still five more books to go before I can say for sure.